Is Work-Life Balance a Realistic Goal? I was recently asked how to achieve work-life balance. My answer surprised the person who was asking. I don’t believe there is such a thing. The phrase “work-life balance” insinuates that there are two different activities – work and life – that we deal with separately from each other. It sounds like the goal is to equally allot the time and energy we invest in each activity. I don’t know about your life, but that never worked in mine! Major deadlines sometimes meant that many more hours were spent at work than at home. Other days, handling life definitely took precedence over work. And, still other times, the lines were blurred. My preferred phrase is “work-life integration.” How can we make our career and the rest of our life work well together? Sometimes, life bleeds into work. Sometimes, work overlaps the rest of our life. Integration honors that reality. How can we successfully live and work so that neither suffers because of the other? How can we thrive in all areas? Successful integration is more like a bicycle built for two. In order to enjoy the ride, both people have to work together. They have to be moving in the same direction, pedaling and braking in unison toward the destination. Otherwise, they won’t be able to handle bumps in the road, energy will be wasted, and the destination will not be reached. On any long ride, there are times where one person pedals faster than the other. But they are still moving forward together. Similarly, work and life have to move forward in cooperation, rather than in conflict, with each other. What do you think? How would you advise someone trying to achieve work-life balance? 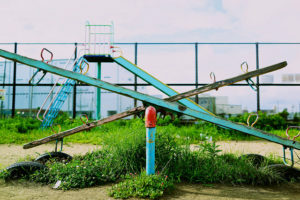 Photo credits: “seesaw” by tablexxnx. 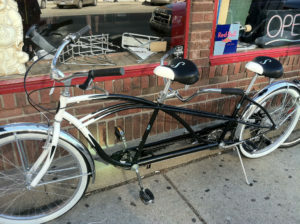 “Bicycle Built For Two” by Hey Paul Studios. Both used with Creative Commons license.